Hello and welcome. Glad you could stop by. My name is Donna, but you can call me kittymom, everyone does. I live in Sacramento, CA with my 3 cats. 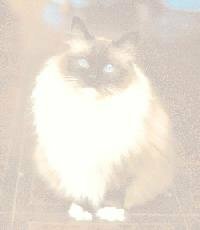 Mai-Ling, she is a 2 yr old Birman. JR, he is 2 yr old domestic short hair & Chloe. 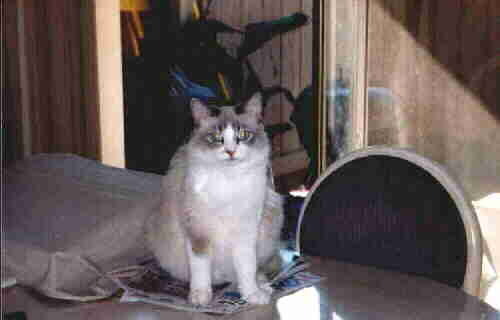 Chloe is queen of the house; she is 12 yrs old, Siamese/Himilyan mix & rules with an iron paw!!!!!! 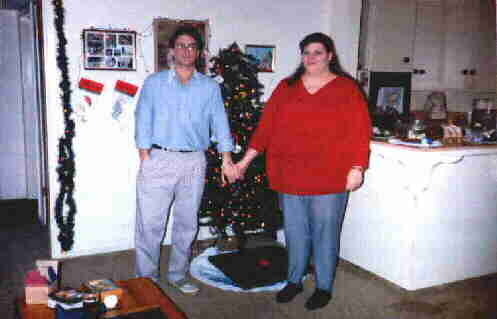 Greg is my 31 yr old married son; Janet is my lovely daughter-in-law & I have a 9 yr old grandson. They live nearby and we visit often. 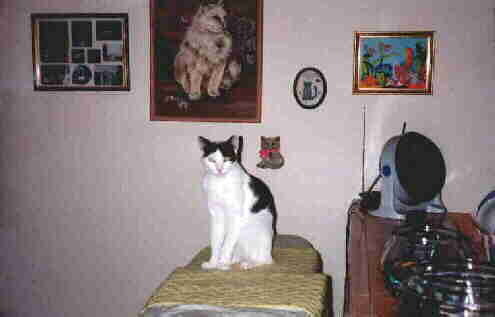 Below are some pics of the family and the spoiled rotten cats!!!!! I am a webtv addict and have met some of my dearest friends on the web. Please visit Mai-Ling's page which you will find later on down the line here. She has some cute pics you will like. The kitties have recently graduated from the Ninja School for Felines. They are very proud and would like you to see their schoolwork. This is a special thank you to a special friend who has helped me learn HTML, email, etc. 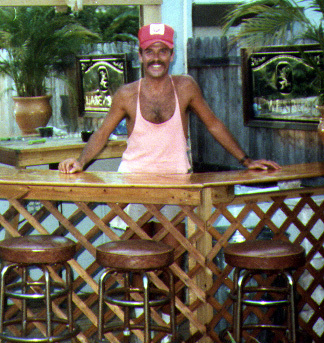 THANK YOU BRAVO-T. Visit Bravo's homepages here. 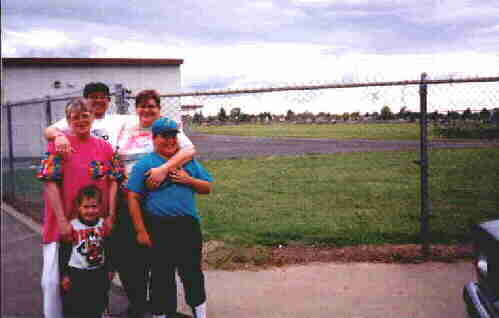 That is me on the left, then Greg, Jan, Sean & Little Nephew. ......Now this is Mai-Ling. 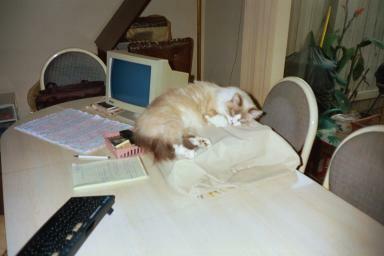 She is supposed to be Editor-in-Chief of this page, and here she is sleeping on the job!!!!!!!!!!!! Now here's trouble, this is JR !!!!!!! This is Chloe. 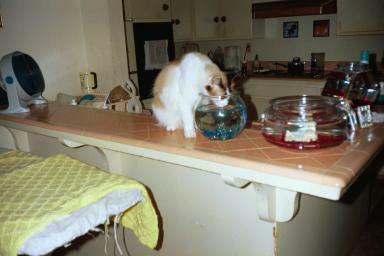 These cats have fresh water everyday, but prefer the fish bowls!!!!! This is the crazy group I work with. 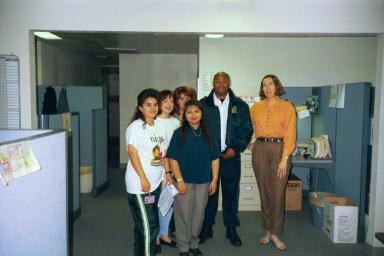 From left to right: Diane, Tina, Karen, Reece & Elaine. That little redhead trying to hide in the back is Claudia. If you're looking for help, Alan has it all right here!!!!!! Please!!!! Help save our animals. Spayng & neutering info. It is so important!!! If you dont find the info you need here, please email me. I will try to help. PLEASE COME BACK AND VISIT SOON!!!!! !